At some point in the days before or up to three hours prior to preparing this dish, bake some potatoes in the oven on a cookie sheet at about 300 degrees for about an hour and a half to two hours. (Scrub them under cool water, and wrap them in tin foil first, for those of you not used to baking potatoes.) Put the potatoes in the refrigerator to cool for at least an hour before handling them. Get out the corn tortillas and the non-stick pan. Turn the stovetop to about medium and spray the pan with Pam. Bake the corn tortillas on the heating surface, for two to three minutes a side. Meanwhile, slice up your potatoes into 1/2 inch by two inch pieces. Once the tortillas are cooked, remove them and put the potatoes in the frying pan for about twelve to fifteen minutes, stirring occasionally–just long enough to get a little carmelization and color. Take two eggs per person out of the refrigerator and crack them into a small bowl; mix in a tablespoon or two of milk, for every two eggs and beat the whole mess well with a fork. Turn the burner heat down to about 30 percent. Pour the eggs into the pan and cook for about eight minutes, until they are no longer runny. 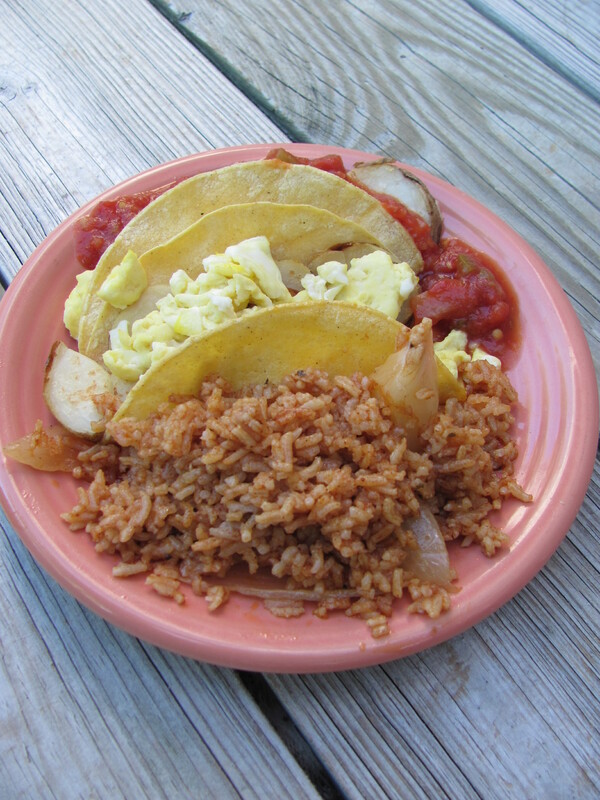 Remove the eggs to a plate and assemble the tacos by placing some potatoes on one side of the corn tortilla, adding eggs, and then folding the whole thing over. If you had school lunches in San Antonio, this is a pretty close approximation to the Spanish rice we got at least one day a week in elementary school. Pour the oil into the non-stick pan and add the spices and the rice. Chop the onion into sixths and add it to the pan. (You can take the chunks of onion out later, if you don’t like to eat onions.) Turn the stove to about 30% or the 3 1/2 mark. Saute the rice for fifteen minutes, until it starts to turn golden brown. Turn the heat up a little bit to about the 4 mark, or slightly below medium and add the liquids. Cover the pan and let simmer for forty minutes. Fluff the rice to finish. Put all of this on a plate and reheat in the microwave on “reheat” where necessary. Add cold picante sauce on the side. Since you made food fit for the Virgin of Guadalupe, used the word “forfend”, AND made a Rick Perry joke all in the same paragraph, this post is officially a total WIN. Mmm. I made this for breakfast for Kian and me a few days ago. I’d make it now if we still had a microwave. Rick has stopped answering my letters.